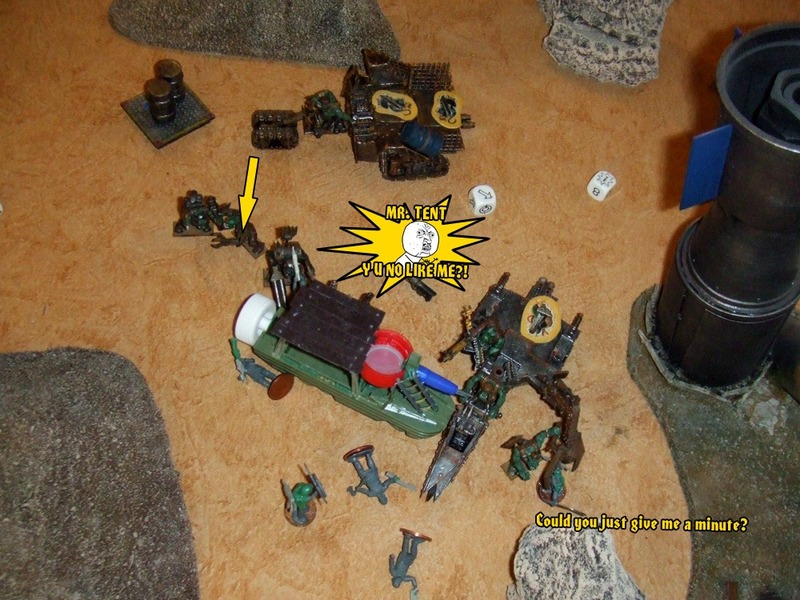 Flamekebab and Skippy have started playing Gorkamorka on a regular basis and at the last clash Depiff just happened to be there to take notes to create a battle report. It’s been a while since we published one as, to be honest, taking the notes to make them slows down the game quite a bit. Tork’s Terrorz are a fledgling Digga mob who have played one game before this one and have just got a new Digganob thanks to some rather unfortunate advances. Hopefully Tork is going to prove himself to be the man for the job, having ousted Zognar. Grimlug’s Ladz are an old favourite here at tUGS who may soon be facing temporary retirement (much like Nazgrab’s Yella Deff). Flamekebab does tend to manage to get pretty decent results from normal Orks, so perhaps he’ll try something a bit different from Gorkers and Morkers soon. In the meantime they’ve acquired a new trak, “Ruzt”, and another yoof to drive it. With a mob rating of 130 and 221 respectively the Diggas stand to gain some real respect even if they don’t win. 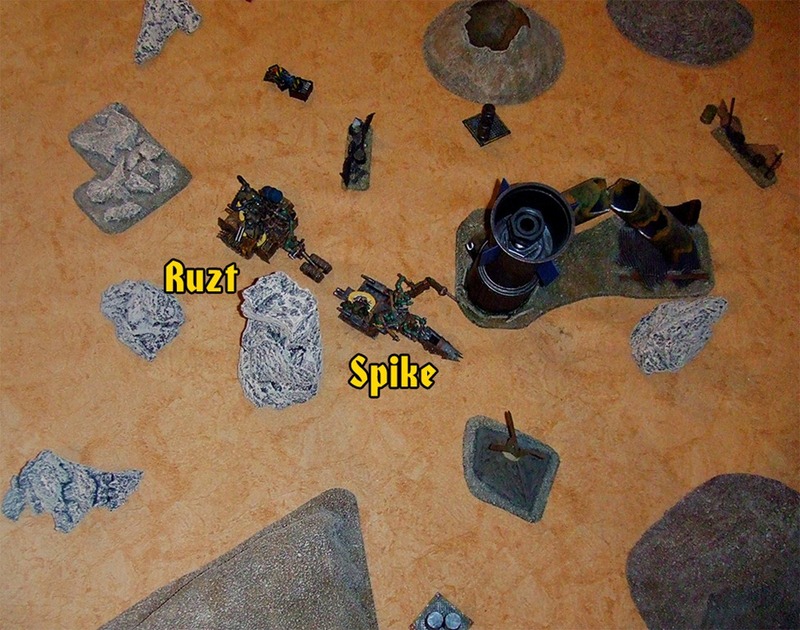 The scenario is Convoy and there are three scrap counters in play, one on the trak “Spike” and two on the trak “Ruzt”. Flamekebab’s Burna rules were used in this scenario and his pre-game reminder chart too. We also use our house rule that all players can roll for recovery in each recovery phase. We’ve done our best to keep this in the present tense but it probably wanders all over the place, for which we apologise. As you can see, Grimlug’s Ladz are moving scrap through the desert and deploy near the centre of the board, travlin’ in single file, to konseel our numbaz! Before anything else can take place Rotgrim, the burna boy, has to pass a leadership test, thanks to some good shooting by Tork’s mob last game. The secondary spanner boy is having to deal with his own Stupidity this game but manages to hold it together, at least for the moment. Firing up the traks’ gas engines the convoy slowly picked its way through the canyon, carefully navigating around the large rocky outcroppings and assorted obstacles. As much as they want to get the scrap to the Mekboys it’s just a bit boring, but no adversaries arrive this turn. Rotgrim’s brain is starting to ache a bit, he’s got a thoroughly strange urge to try to chew on his own ears, but despite this he manages to keep a cool head. The convoy proceeds a little, taking care around the terrain. After all, if the cargo gets too damaged there won’t be any fungus bear, and that doesn’t make anyone happy! Suddenly there is a loud revving and a lot of shouting hurtling towards the lead trak. The new Digganob, Tork, is clearly very eager to get into the action and to establish himself as one brave git. T-boning the trak seems to be the best way to do it, but unfortunately something goes terribly wrong. Terribly, terribly wrong. 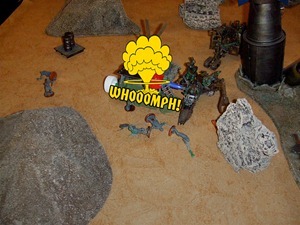 With an earth-shattering explosion the trukk’s engines explode throwing Diggas in all directions! Zognar, the old Digganob, is thrown into a rock, taking several hits and going down. Bathazark, Tork’s shaman, goes over the side taking a flesh wound and swearing profusely. Aldorg ends up thrown clear of the wreckage, well behind the trukk. The shock proves too much for him and he goes down. Ansvark joins him, but he’s not so easily phased and is back on his feet within a few moments. Snikolai falls over the other side, getting a face full of tent and going down. Tork himself is thrown head-first into the trak, braining himself and going out of action immediately. Axel, the latest addition to the mob, finds himself bleeding with a trak bearing down on him. He hits the deck whimpering (down). Larz keeps it together and hops over the edge of the vehicle and takes cover behind a wheel, shielding himself from the blast. Knutta is not so fortunate, and finds himself in the middle of Spike, the Ork trak! The impact puts him down, or perhaps it’s the huge snarling warriors looking at him? Dagfinn also thinks quickly, slinging his shoota over the edge and jumping after it, ready to enter the fray. The trak driver also takes a hit, but it is just a small bit of shrapnel and doesn’t even wound the lucky blighter. Grimlug and his boys let out a hearty battle cry, happy for the distraction! The four Diggas left standing are not about to let their mates cop it straight away, at least if they can help it, dakka dakka dakka! 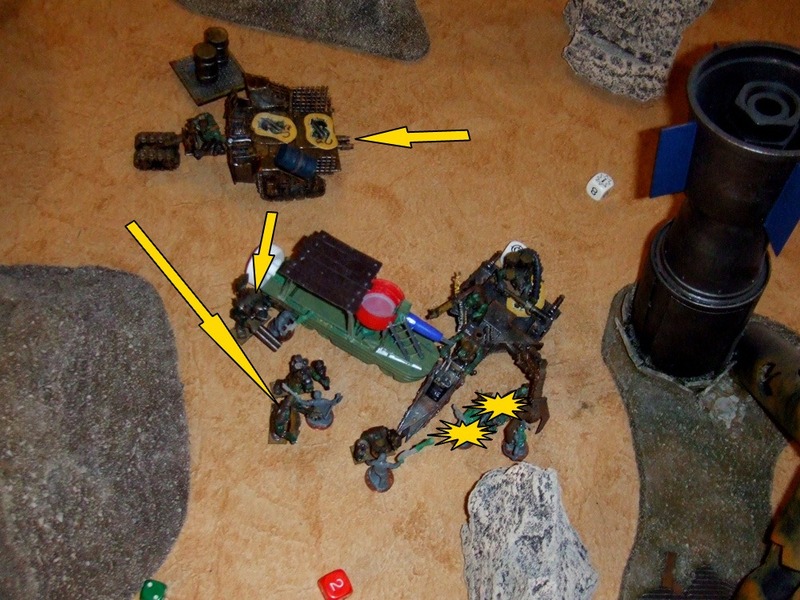 Dagfinn lets off a burst of shoota fire at the trak, penetrating the armour and hitting Skrognik. 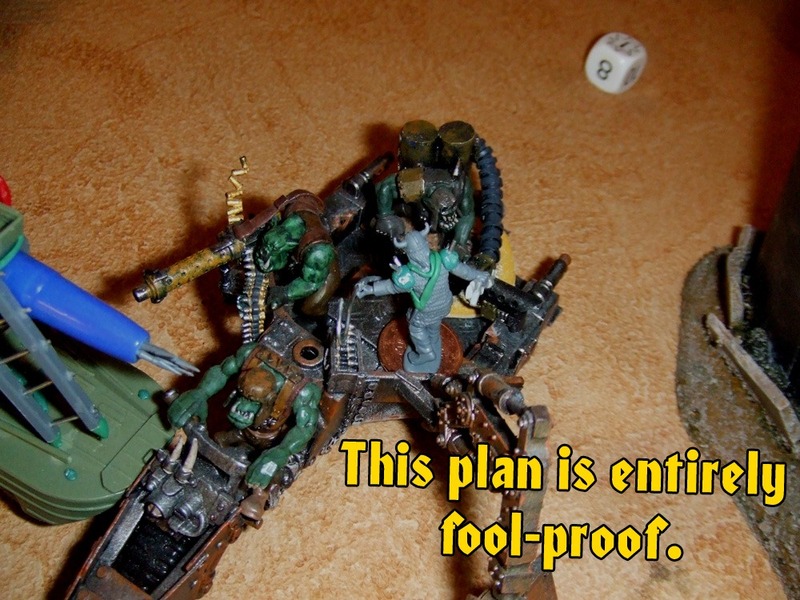 The yoof snarls at him but no actual harm comes to the Ork. Larz takes a deep breath and squeezes the trigger on his blunderbuss, hitting Spike’s big grabber, unfortunately not doing any real damage. Lastly Bathazark tries his luck, firing his shoota at the trak, penetrating the armour but failing to cause any harm to anyone on board. Rotgrim’s head is really starting to feel funny now, perhaps a little burnination will help clear his head. One failed ammo roll later and it seems the tubing was leaking the whole time as there’s barely enough fuel left. With any luck it’ll be up and running next turn for a little bit of hand to hand*. While the spanner boy is having troubles with the world Ogkart, the driver of Ruzt and newest member of the mob isn’t doing much better, attempting to thrust and failing miserably. Things aren’t going that much better onboard Spike as Wazbag fires his six shootas wildly at Dagfinn, pinning the poor Digga but failing to wound. 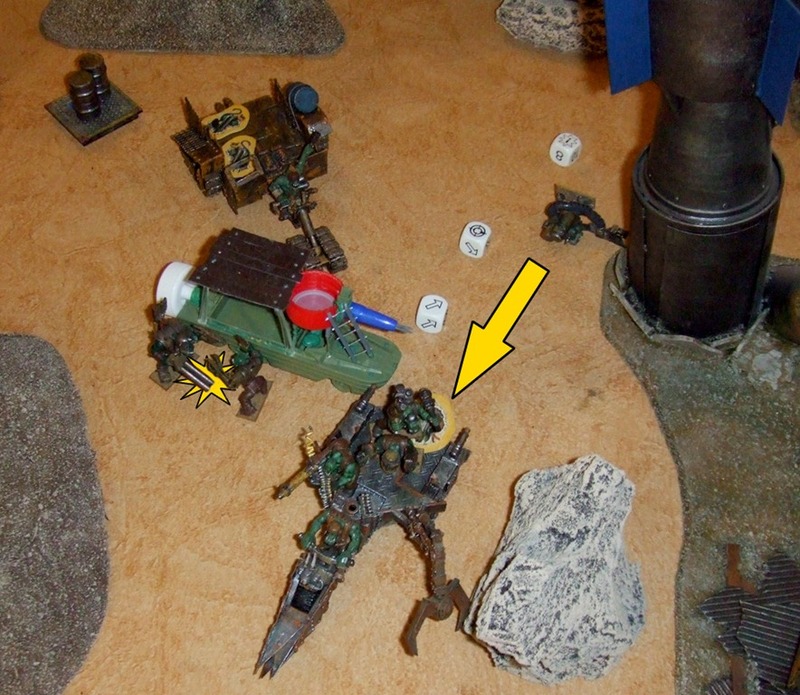 Unluckily for the Digga though the Ork barely seems to notice as his six-shoota explodes in his hand. Apparently having an iron mask for a face rather changes your perspective on pain! Attempting to mow the remaining opponents down ZodZod unleashes the squigs of war, firing a hail of ‘Eavy Shoota fire at Larz and Bathazark. Despite the volume of fire only a single shot hits each man, or so it would seem. Bathazark takes a hit but Larz hits the deck mere moments before hot lead fills the place he was standing, a feat that is no coincidence. 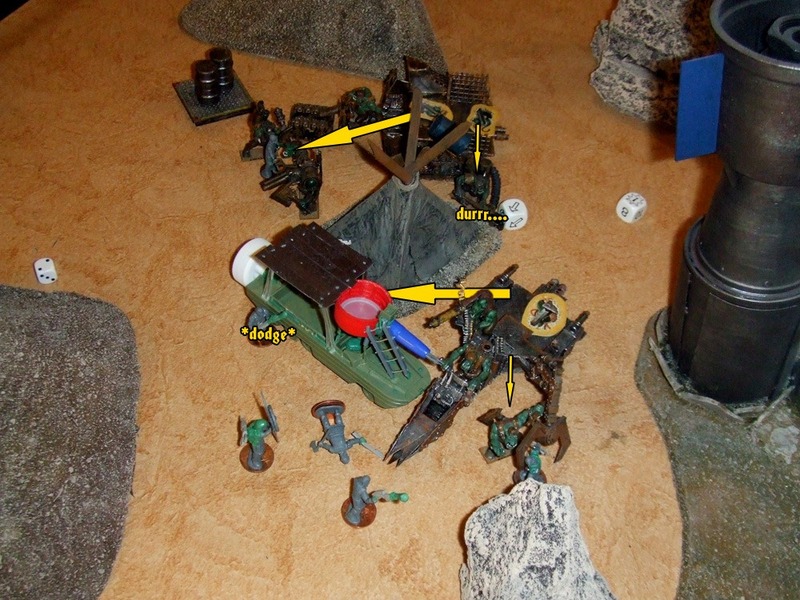 Spike’s driver, Zogdreg, feels a little left out with only downed and pinned targets to go for, but sadistically goes for Axel, hitting him but doing little more. Similarly Gorog’s kannon fire does little but deafen those around him, he just wanted to show off in front of the boss. Of course, Grimlug isn’t paying attention to Gorog, he’s levelling his own kannon at Ansvark, knocking him off his feet, putting him down. Lastly, adding injury to injury (there’s probably a fair bit of insulting going on too, but the grievous bodily harm is more interesting!) Skrognik swings a finishing blow in the direction of Knutta, putting him out of the day’s proceedings. In the recovery phase Zognar stays down, Axel is back up with a fleshwound (but still pinned) as is Aldorg, Bathazark has two flesh wounds but is at least pinned, much like Larz. Anzwark is not so lucky, passing out (Out of Action). With nearly everyone pinned there’s not much Tork’s boys can do, but Aldorg at least makes a go of it, throwing a well intentioned frag stikkbomb at Ruzt with great enthusiasm; perhaps a little too much though as it goes right over the trak landing somewhere far off. By the end of the turn most of the Diggas have shaken off their pressing desire to survive and recover from pinning, although Snikolai is still down. *Technically he’s supposed to wait until turn 5 to be able to use it in hand to hand, but we didn’t realise our mistake until after we’d worked out the events of turn 4. Rotgrim, baffled as to why he can’t get his burna working feels himself losing IQ points by the second. He’s stupid, at least for this turn. Wandering off the trak he decides to say hello to kindly Mr. Tent. Aldorg’s grenade was apparently not so well received, and Aldorg finds himself facing three rather menacing greenskins; Gutrunt, Gorog, and Grimlug. Similarly displeased is Wazbag, not content with the minimal damage his six-shootas are causing he pulls a knife from his boot and advances on Dagfinn. As everyone else is doing it Skrognik decides to charge the pinned ex-Digganob who doesn’t look all that tough scrabbling in the dirt! Left to supervise the scrap Ogkart figures he’d best get the trak facing in the right direction, muttering under his breathe about never getting to do anything fun he pulls a three-point turn so he can pick the lads up when they’re done, or if he’s really lucky, run over some pesky Diggas. 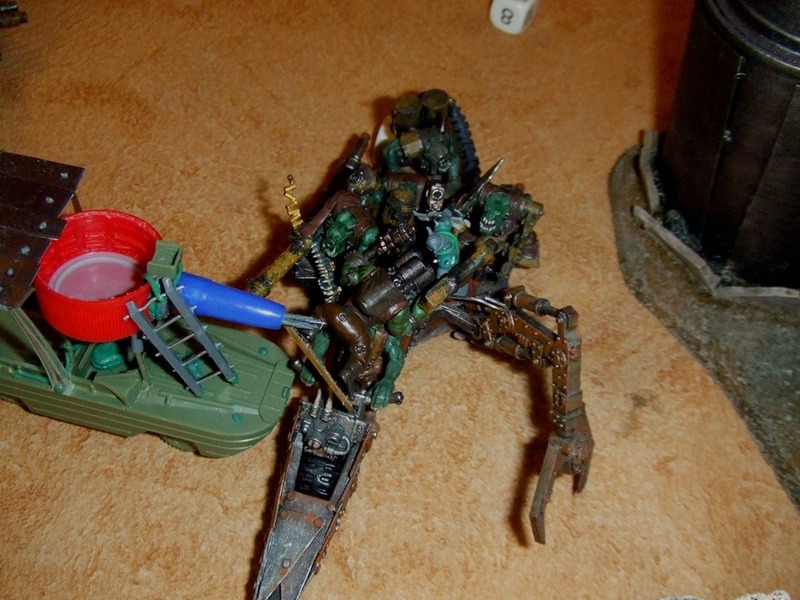 Zogdreg wishes he could move Spike, but ZodZod is quite happy where they are and you don’t mess about with a spanner boy standing behind your head with a loaded ‘Eavy Shoota. To pass the time he takes a few more potshots at Axel, pinning him again. Squeezing the trigger and laughing, ZodZod has another go at Larz and Bathazark, missing the shaman completely and seeming to hit the Digga boy again, or so he thinks but the lack of blood is disturbing. 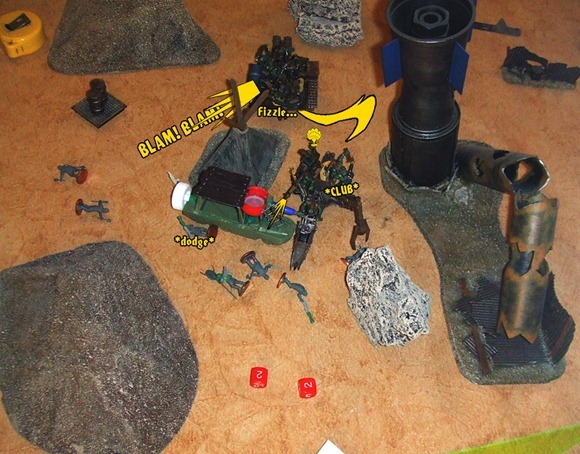 The gunner is right – Larz wasn’t wounded, he dodged again! Zognar, on seeing the advancing Ork yoof figures it’s as good an opportunity as any to try out his fancy new Archeotek. It’s a… thing, or something, if only he could get it working. Perhaps it’s this button? ZZZZZZZZZAP! The old Digganob didn’t enjoy that, he’s not feeling particularly good any more (one flesh wound), but he really needs a decent weapon to take on that burly greenskin. One more try? Another flesh wound later and the Digga decides those last two were practice run, it’ll definitely work this time! Nice! Some sort of power weapon! Zognar fends off the blows as best he can but it seems the Ork yoof barely knows what he’s doing, as none of Skrognik’s blows manage to wound. The same can not be said of Gorog, who cuts Aldorg down in a flurry of blows, moving onto Dagfinn (accompanied by the others involved). Mr. Tent is mean and doesn’t want to talk to Rotgrim. Rotgrim doesn’t like Mr. Tent. There’s a blue cutting flame coming from the end of his burna though so he tears Mr. Tent apart and follows up towards Dagfinn. Speaking of Dagfinn, he manages to hold his nerve against the brown-trousers-inducing Ork that is Wazbag (and his fear causing Iron Mask). The scary git does get his adrenaline going though, which must be helping as he fends off everything that is thrown at him. Recovery phase time – Snikolai is back on his feet, but pinned. Tork’s brave warriors hold it together though, refusing to bottle. Bathazark even charges the Ork yoof that’s giving Zognar grief. Although the shaman’s abilities in melee combat are clearly superior Skrognik’s leathery skin just shrugs off the blows that land. Zognar’s power weapon has no such trouble, and after a struggle he manages to draw blood, giving Skrognik a fleshwound. 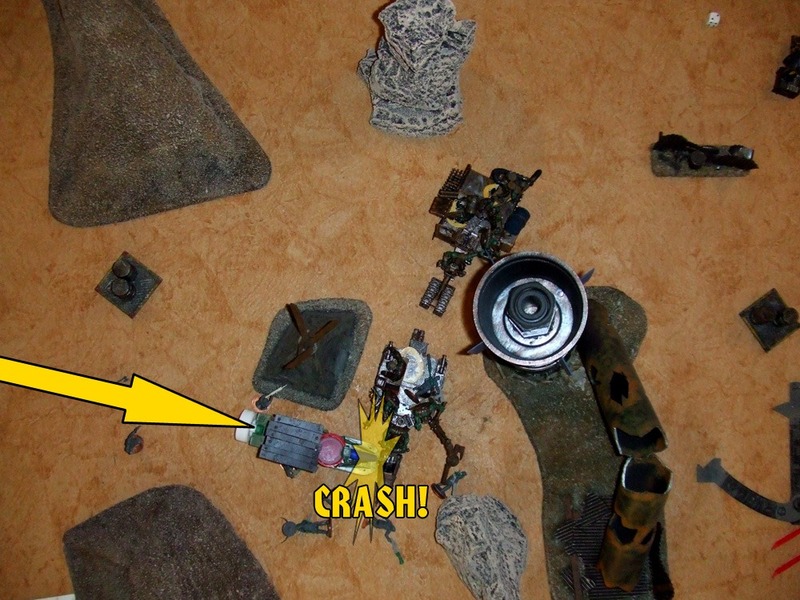 Dagfinn is not so lucky, ending up in pieces on the desert floor (presumably Wazbag got him, but the notes don’t record who struck the incapacitating blow). Rotgrim doesn’t get much smarter this turn, but as Mr. Tent is gone perhaps it’s time to go home. He stumbles over to the other trak (Spike) and clambers aboard. Grimlug has yet to get a taste of combat and is sick of it. He may have a gammy leg, but they should save some for him, he is in charge after all… Lumbering forward he gets stuck into Larz. Let’s see if he can dodge a choppa, shall we? Wazbag moves on to Axel, while Gorog and Gutrunt take the fight to Snikolai. Zogdreg and ZodZod find themselves a little short on targets and so sit there like lemon squigs. Ogkart is on the move though, heading forward to keep up with the fight. Larz doesn’t manage to dodge the heavy blows Grimlug deals out, but he’s still remarkably lucky, escaping injury even when struck. Gutrunt has a bit more luck though – he’s not very skilful with his powerklaw, but when it hits, it hits. Snikolai didn’t stand a chance, really (Out of Action). He and Gorog then follow up to join Wazbag and Axel. 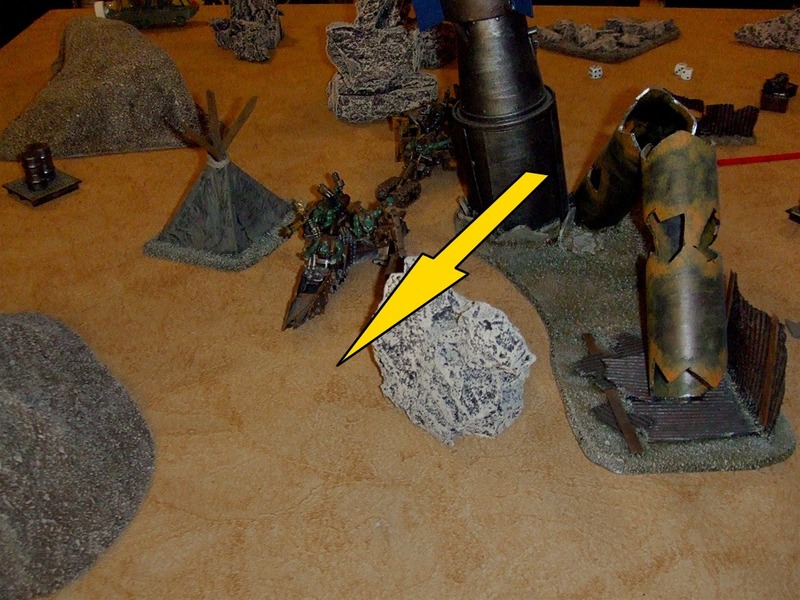 Axel doesn’t manage to deal any wounds to the rather tough Ork (T5), even though two of strikes connect. Skrognik has got two Diggas on his hands but manages to put Bathazark, the shaman, out of action with relative ease. He is not so lucky against Zognar, whose power weapon puts the yoof out of action in short order. Zognar follows up by moving close to the trak, planning to exact revenge on the crew. Heavy losses mean nothing to Tork’s Terrorz, passing their bottle test again. Zognar puts his plan into action and boards the stationary track. There’s no shooting this turn though – everyone’s in hand to hand, getting their hands dirty like a proper greenskin. Grimlug continues his onslaught on Larz and nearly hits him, but once again the slippery git dodges. That’s some impressive footwork, one must admit. Axel has to deal with the frightening visage that is Wazbag and unlike Dagfinn starts gibbering, at which juncture Gutrunt puts a powerklaw in his personal space and squeezes. Understandably he goes Out of Action. Once again opponent-less Gutrunt heads towards Larz, whilst Gorog and Wazbag start to clamber onto the trak. Zognar’s plan may not be entirely thought through, but he’s going for it anyway. Fortune favours the bold it seems (for now) as he takes on the thickie that is Rotgrim, hurling the spanner off the trak and putting him down. That went well! Unfortunately he had forgotten about the other spanner boy, ZodZod, who has been feeling a bit left out. Laying into the poor Digga who does his best to dodge (he too has the Dodgy skill) but 75% of the blows still land, putting him Out of Action; the extra fleshwounds are too much to bear. In the recovery phase Rotgrim manages to create a puddle of drool but still stays down. Now empty of unwanted passenger Zogdreg guns Spike’s engines and starts moving forward while Ogkart tries his best to turn Ruzt to get in line. Of all the Diggas there is only one left, Larz. Time for a famous last stand, he reckons. Gutrunt flails wildly with his powerklaw but fails to wound the plucky Digga boy. Grimlug pushes the Ork aside and swings his choppa with brutal efficiency, inflicting eight hits on Larz. His luck persists to the end though as he dodges two strikes and avoids being wounded by a further two. Four hits from Grimlug is enough for anyone though, and he finally goes Out of Action. With no more Diggas left on the board, Grimlug’s Lads are the victors. Tork’s Terrorz are braver than they look – they fought to the last man, pretty admirable, one must admit. In spite of their injuries many of the Diggas made a full recovery. Axel ended up with an old battle wound as did Knutta and missing an eye too. 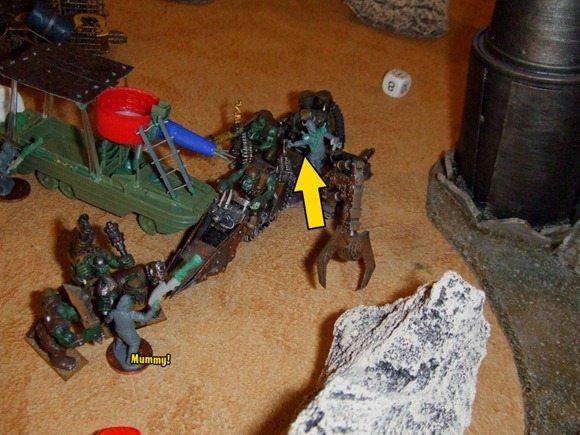 Bathazark received multiple injuries and woke up in extreme pain surrounded by Orks. Despite his condition he begged to join their mob, as per every Digga’s dream, but after some discussion he was found unworthy and was instead ransomed back for five teef. Aldorg was not so fortunate and Gorog’s attack was too much for him to bear. Mortally wounded he died before they could drag him back to the Pyramids. Larz and Zognar both managed to survive against the odds though, proving themselves the ‘ardest in the mob by a long stretch. Similar fortune favoured their trukk, Gorkstad, which seemed to be working just fine after being left alone overnight. How odd. Grimlug’s Ladz only had a single casualty – Skrognik, one of their yoofs (although he became a boy with the experience earned in this game). He did receive a leg wound though and when taken to the Dok ended up the not so proud owner of a peg leg. Marvellous. Rotgrim’s wounds turned out to be largely superficial, although the same could not be said for the state of his brain. To the Dok he too was sent who didn’t know what to do with him, or perhaps he knew exactly what to do, even if it was somewhat eksperimental. 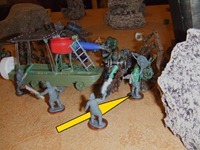 The rest of the mob weren’t that lucky either as there was a collapse in their scrap mine, injuring several of them. Full recoveries were made though, so it wasn’t all bad. Overall it was an impressive game and Skippy should be applauded for getting into the spirit of the game. Many would bottle out, but not him. Like a true Digga he toughed it out to the bitter end to impress the greenskins. They were impressed enough to let the shaman go, in the spirit of Ghazghkull himself. I let ‘im go ‘cause good enemies iz ‘ard to find, an Orks need enemies ta fight like they need meat ta eat an’ grog ta drink. Result: Victory to Grimlug’s Ladz. This entry was posted on Sunday, February 13th, 2011 at 03:07	and is filed under Battle Reports. You can follow any responses to this entry through the RSS 2.0 feed. You can leave a response, or trackback from your own site. I like this report very much. I am an Ork player, but never thought of Vikings as diggas. I also have the Wargame Factory Vikings, and migh just make up a digga mob with them. He decides to say hello to kindly Mr. Tent. wow that is the best thing an ork can do. I’m going to have a grot Head Honcho named Mister Tent now.